Amid the flying buttresses was a center of peace and calm. A woman, long hair flowing, barefooted, danced the labyrinth. She moved in waves of silken silence, enraptured by the “unheard music” (2) of the cathedral whose invisible sounds were rendered visible by her body as the music flowed through her. All was silent. Not even her bare feet made a sound as they moved, effortlessly, on the cold pavement stones. There was only the dancer at the center. All else was irrelevant. I was transfixed. Who was she? Although I saw her in a very tangible, very physical sense, she must have been a spirit of some sort because not everyone could see her. And yet her light, although muted, was at the same time, dazzlingly radiant. Some of those few who had seen her said that she must be the ghost of ‘Our Lady’, the Blessèd Virgin Mary, whom everyone, naturally, assumed to be the reigning Queen of the Cathedral of Notre Dame de Chartres. This was, after all, reputed to be “the earthly palace of the Queen of Heaven.” (3) There had been rumors, though, that the cathedral had been secretly dedicated to the Magdalene, so others whispered that maybe she was that other Mary. But as I watched the way she heard the notes and, embracing them, floated in the harmonies of the cathedral, I thought her to be a poet of great skill – a bard revered by all. And why not? This flawless sanctuary was said to have been built upon the ruins of a sacred forest, the most sacred place in all of Gaul, where the Druids gathered, like birds, thousands at a time. The light around her had intensified, and soon she was so enveloped in its brilliance that I was forced to close my eyes. But I could still see her, dancing. I thought for a moment that she must be the Sun. The Michelin Guide’s description of this meridiana, (from medius ‘middle’ + dies, ‘day’) as it is known, is somewhat more specific, but there is a bit of confusion as to the actual times of year that the light is recorded on this instrument. Although the solstice of winter and the equinoxes are marked as particular points of reference, it would appear to be an everyday event. So as not to confuse the reader between the line that is set in the floor at Saint Sulpice, which continues up the marble obelisk that serves as the gnomon, and the other line – the true Zero meridian line that runs through the Observatory itself – , the author is careful to note that “Midday bearings are to be found elsewhere in Paris besides on the actual meridian.” (8) St.-Sulpice, which is shown on his diagram as situated exactly due West of the Zero Line, is a case in point. As a prelude to his intriguing, but largely plagiarized “research”, (12) the author goes out of his way to print a statement of “Fact”, which declares, among other things, that: “All descriptions of artwork, architecture, documents, and secret rituals in this novel are ac-curate.” (13) In view of the extra effort expended to inform readers of the accuracy of the descriptions that serve as the background of his novel, one would expect that to be the case. Unfortunately, saying it doesn’t make it so. Let us just say, for the sake of brevity, that the Rose Line is a figment of someone else’s imagination; that the actual and true Prime Meridian of Paris, the Zero degree longi-tudinal line that once determined the place of beginning for the measurement of all longitudes prior to its “correction” to Greenwich, does not now, nor has it ever, run through the Church of Saint Sulpice; that the line which does run through the church was established for reasons unrelated to the calculations of longitude; that the line in the church does not cut across the holiest place in this, or any other, church – namely the altar –; that the line does, in fact, (as he correctly states) “cleave[d] the communion rail in two,” (14) and as is the case in all churches, the rail is situated some many feet distant from the sacred altar, making it physically impossible for the line to intersect both; and finally, that it is not the line itself which is the gnomon but, rather, the vertical obelisk. And while you are thinking about all of this, we quote the words of Titus Burckhardt, a true scholar of the sacred who has said, “the altar is for the cathedral what the heart is for the body.” (15) Now imagine the unimaginable gravity of the sacrilege that would have been committed if such a line had been cut across the altar. C’est impossible! At Chartres Cathedral, there is a less grand design, one whose intention is to annotate the specific point of the sun on a particular day of the year. This day is marked by a gleam of sunlight on a metal tenon that rises slightly above the natural level of the floor, actually creating a tripping hazard if one should not see it, and perhaps this is the idea – to draw our attention should we be so blind as to somehow miss it. This marker further draws attention to itself by its placement within the confines of a single rectangular flagstone that is lighter in color than the surrounding stones, and which is laid upon an angle in the otherwise “squared” design of the floor. first on the western side of the transept. . . .
streams through a clear pane of glass in the stained glass window of St. In these precise, virtually identical descriptions of the placement of the tenon, the direction of the illumination and the calendrical correspondence, we have an un-questionably clear picture of this phenomenal event. However, when one reads a description of this scene, purportedly obtained from direct observation, by another highly respected scholar of Chartres, the Celticist Jean Markale, a troublesome question arises with respect to the placement of the tenon and the date on which the sunlight strikes it. We caution the reader that the gratuitously dropped, utterly absurd assertion made here that there are only two cathedrals in all of France that contained labyrinths is totally false. (27) We note also that, unlike the heliometer of St. Sulpice, the simple nail at Chartres was never intended to mark the passing of the “solstices and equinoxes,” but only to establish the moment of the Summer Solstice and nothing more. And fortunately for us, there is nothing “perfectly ordinary” about any of this at all, except that it’s not the nail we’re looking for. Unfortunately, this confusion of the precise positioning of “nails” threw this seeker off the track for some time, particularly since I had presumed that such a gnomon would most logically mark the very center of the labyrinth – the light illuminating the womb, and all that. But it was not so. And, begging to differ with Jean Markale, who has led us all down the wrong path so many times, there is a most urgent need to seek answers, and an even greater need to be open to their truths or their falsehoods, wherever they might be found. Such was the case with Canon Estienne himself, who, like the curé of Saint-Sulpice, seems to have been inspired by motives other than those of ecclesiastical dating. According to our misinformed Celtic scholar, the Canon’s curiosity extended itself deeply into the religious mysteries of the Druids. His unflinching search for truth led him to many revelations concerning the pre-Christian roots of the mysterious Cathedral of Chartres. The findings, which Estienne published in a well-researched text in 1682, have led others, including Markale himself, to some startling conclusions. (28) With our eyes wide open, we, too, intend to explore these Pagan roots. But first, we must resolve the discrepancy of the timing of the light on the tenon at Chartres. Umberto Eco, the great master of semiotics, offers us a humorous solution to the mystery in a great throw-away line. In the midst of a wild and rambling tour de force of free-association, one of his characters in Foucault’s Pendulum suggests a rereading of all of the works of Shakespeare . . . “Saint John’s Eve, a midsummer night’s dream.” Another quickly responds that “June 23 is not midsummer,” and is quipped by the obvious explanation of the confusion of days: “Poetic license.” Talking about something else entirely – everything else, actually, – but with this fresh in our minds, he adds, “I wonder why everybody overlooked these clues, these clear indications. The problem arose from the fact that the Pagan festivals of the Romans centered on the very strict astronomical observance of the quarters of the year. The systematic eradica-tion of these earlier observances was to be accomplished by the not-so-simple overlay-ment of Christian holy days that only approximately coincided with the quarters of the solar year. Over a period of several hundreds of years, long before the “Venerable” Bede confused us with his misnomer in the 8th Century, the Christian bishops fabricated various methods of miscalculation. While the ecclesiastics would appear to have been unaware of what was common knowledge in the Roman world: that the period of gestation was counted in lunar, not solar, months – ten lunar months – or 288 days, to be exact, (37) we can be certain that they were not arithmetically-challenged. There was method in their madness, for they were all-too aware of this disturbing lunar connection in their solar-oriented universe. Changing the unchangeable biological facts of life and severing the very ancient and essential connection between women and the cycles of the moon is a Promethean accomplishment, indeed. But their deceptive time-scheme was critical for another reason as well. The solution to the question of when, exactly, the sun illuminates the flagstone and tenon at the Cathedral at Chartres is to be found at Newgrange where, at the Winter Solstice, the sun makes a dramatic appearance inside the darkened tomb. We can surmise, then, even without first-hand observation, that the sun in the Cathedral strikes the stone for a similar period of five days at the Summer Solstice, that is to say, from June 20th to the 24th. Thus, does it shine at noonish on whichever day the Sun enters the Tropic of Cancer on the Solstice, which varies from year to year between the days of the 20th and the 22nd, and on Midsummer’s Day, and on St. John’s Day. The illumination at the Cathedral at Chartres, although unique in its contrivance, was not an isolated occurrence. It seems that Charlemagne (742-814 C.E.) had his own very grand ideas about how to reflect the light of the longest day of the year. Although this stunning bit of drama has been noted as having occurred on Midsummer’s Day, one is never sure whether the more likely timing for such splendor would have been at the moment of the Summer Solstice. On that day, Charlemagne sat on his throne in the octagonal Palatine Chapel attached to his palace at Aachen waiting for the sun. In the world of the sacred, where time is out of time and space not-space, “a ritual progress is not a mere walk; it is a dance . . . [and] a labyrinth, . . . a dance-pattern written on the ground.” (74) The enormity of the labyrinth of Chartres, stretching almost from pillar to pillar across the whole width of the nave, this “round table,” as Charpentier calls it, so reminiscent of the ancient “Fairy Rings,” made it especially useful as a “ritual dance-floor” at a time when “round dances in the cathedral of Chartres, led by the bishop himself, were customary at Easter.” (75) To join the dance was to renew one’s connection with the natural world as it was renewing itself, partici-pating in that glorious rebirth of Spring upon which Easter and its attendant mythology is entirely based. Such joyous cosmic dances had been celebrated throughout the ancient Pagan world long before the coming of Christianity (76) and they were joyfully contin-ued here. first led the dancers with it into the centre of the labyrinth and then out again. Another scholar thoroughly versed in the dances of ancient Greece, Lillian B. Lawler, has a slightly different perspective on the the geranos, the insightful details of which she unfolds in her scholarly work, The Dance in Ancient Greece. First, she unravels a most important puzzle concerning the meaning of the name of the dance. winding path of a serpent. There is a natural perfection to everything at Chartres, – from its magnificent propor-tions rooted in the harmonics of geometry (‘earth measure’), to the unsurpassable beauty of the coloration of the stained-glass, to the centering that comes of walking the ins and outs of the labyrinth, to the unimaginable complexity behind the ease with which the flying buttresses soar. of all of these extraordinary aspects, the thing that allows the energy of Chartres to resonate so powerfully, the root cause of the palpable emanations of spirit arising from this masterpiece of a cathedral, is its grounding. We must, therefore, seek out, amongst a host of other things, “what is below” the surface of the original foundations upon which Chartres was built in order to know the nature of the mysterious energies that lie at the very heart of the cathedral. there was once a sacred forest on the hilltop where Chartres now stands. We note that, although it is not at all clear from the canon’s statement, this is the ancient sacred well that was later enclosed within the expanded cathedral, the very same well from which the telluric energies are said to arise in a straight line from the bottom of its waters to the furthest reaches of the cathedral’s equidistant vaulted ceiling where the pointed arches cross. One of the worlds most informed geosophists, John Michell, has much to say about the knowledge of how to control and make beneficial use of “those invisible currents which move over [and under] the surface of the earth, the fields of gravity and electromagnetic energy” which, he says, goes back to the earliest civilizations of prehistory. (94) He has shown tangible example after example throughout the countryside to prove that “all over the earth, there are spots associated with strong supernatural or spiritual manifestations, which have been spoken of as centres of terrestrial magnetic current.” (95) And as if he needed further documentation, he quotes the findings of an older authority on these matters upon whose shoulders he was proud to stand, the author of The Fairy Faith in Celtic Countries, W. Y. Evans Wentz. of the Carnutes, the site of the great Druidic college and centre of inspiration. the summer solstice, when the sun reaches the climax of its northern journey. It was given them by an astronomer. The most curious fact of Chartres’s architectural orientation – that it is not sited in the requisite East-West direction of other Christian churches – is rigorously explored by Gordon Strachan in Chartres: Sacred Geometry, Sacred Space. His startling discoveries, which represent a great contribution to the furtherance of knowledge about this Cathedral, also have a distinct bearing on the question of the day on which the beam of light was intended to strike the tenon at Chartres. After reminding his readers of an ancient dolmen which has long been thought to lie deep within the pre-historic mound on which Chartres rests, Strachan tells us something so incredible that it seems impossi-ble that in all these centuries, no one else has noticed it. of Our Lady of Chartres is aligned to the Summer Solstice. to Stonehenge at 50.25º E of N and midsummer sunrise at 51.58º E of N . . .
And that is not all. This keen observer of architecture reveals a second deviation from established pattern, an anomaly that contributes to the effects of the subtle forces of sound that are said to be felt in the Cathedral. The Pythagorean Comma is, in fact, a very sophisticated mathematical concept having to do with the harmonic variances between perfection and reality in the tuning of instruments; in the inaccuracies of astronomical observation from a planet that is not only always in motion but which, additionally, wobbles on its axis; in the inequities of time as it pertains to the calendar; and in other somewhat lesser-known imperfections of the universe. (104) Among these fractional issues is one of great relevance to the musical-ity of Chartres. In an endnote briefly outlining and exemplifying the Pythagorean Comma, Strachan explains that “in ancient and medieval cosmology, the lack of syn-chronicity between the cycles of the sun and moon was likened to the musical disparity between tuning in octaves and tuning in fifths.” (105) This disparity is exactly what creates the vibrato effect. In his analysis of the “musical mystery” concealed in plain sight in the perfectly proportioned geometric masterpiece that is Chartres, (106) Charpentier speaks of “the geometry of the plan of elevation of the cathedral” as being “altogether musical”; (107) of the presence of “the ‘divine triangle’ of Plato . . . [which in and of itself] leads to a search for modalities”; (108) of “Fifth and octave . . . [which] leads us to a search for all the intervals of the scale”; (109) and of “the geometric scale of the transverse lengths [which] correspond with the heights of the tone.” (110) It need hardly be said that every-thing is “in perfect harmony” (111) with everything else. The energy was there from the very beginning at this site upon which Chartres was raised. That is why a dolmen had been set up at that very place some three thousand years before – to serve as a collector of the raging telluric currents hidden beneath the earth. So convinced is Louis Charpentier of the awesome power of this ancient dolmen that he attributes the non-Easterly orientation of the cathedral to have been the result of “the direction of the telluric current”; (124) the intention of the singularly unusual alignment having been established so as to allow the worshipper to “face towards it,” to “bathe in the terrestrial current.” (125) Let us not forget that the orientation of the cathedral to the sunrise of the longest day of the year, the Summer Solstice sunrise of June 21st or thereabouts, may have produced extraordinary pulsations on that day. Perhaps that is what the mystery behind the illumination of the tenon in the stone is all about, a way of illuminating us to the fact that this day is unique, – this day somehow mistakenly called by some “St. John’s Day,” after John the Baptist – that it is the one day in the year when the earth currents are so powerfully present in this uniquely aligned cathedral that a person so attuned could actually bathe in the waves of energy that could potentially wash over their entire being as a wave of the sea. There was an idea put forward by Robert Graves that offers startling monumental insight into the mythology of Belenus concerning the warring brothers Belinus and Brennius, whom this mythologist-poet reminds us are mentioned in Geoffrey of Monmouth’s 1136 History of the Britons, and who “are generally acknowledged to be the gods Bran and Beli.” (139) This is the very same Beli who is “the Supreme God of Light” (140) in the ancient Welsh mythic poem Câd Goddeu (‘The Battle of the Trees’). (141) Graves assigns “the older, larger, grander Avebury ring” (142) of giant stones as the seat of power of the Alder-god Bran, which is substantiated by the fact that “all the available evidence points to Stonehenge as Beli’s seat . . . [as] it is laid out as a sun-temple in cultured Apollonian style which contrasts strangely with the archaic roughness of Avebury.” (143) If Graves is correct in this presumption, and we believe that he is, then Beli’s association with both Stonehenge and Chartres is as remarkable and astonishing a happenstance as is their mutually oriented axes to the Summer Solstice sunrise. We note that it is Belen who was pledged to her, and not the other way around, which would suggest that she, herself, is a solar deity of some stature. And, indeed, she is. Bélisama is a goddess “associated with high summer” who seems to reign over “all types of fire” and light, “including sun- and moon-light.” (155) The very ancient Proto-Celtic roots of her name, ‘Summer Bright’, from belo- ‘bright’ + samo- ‘summer’, (156) leave no doubt as to her function as the Gallic goddess of the Summer Solstice. Her aura is very present at Chartres, and not only in the cathedral’s alignment to the solstice of “high summer”, but in many other ways, subtle and not so subtle. There can be little doubt that the healing functions attributed to Belen must have been “borrowed” directly from his female half’s mythology. After all, methods of healing associated with miracle-working restorative waters, such as those waters found in the Druidic well that is now situated inside the Cathedral of Chartres, (157) are, almost without exception, an indisputably goddess-identified attribute. It is assumed also, that Bélisama’s healing powers were inherited from the serpent-bearing Minerva who was revered for her powers of wisdom and healing. (158) But as Bélisama is the far older of the two on Gallic soil, the more likely scenario is that this was a late identification that arose during the Roman occupation of Gaul. Their commonalities would have encour-aged the blurring of any distinction between the two, which is often a ruse of the con-queror to marginalize the earlier indigenous deity. perrons, menhirs, all without doubt fertility-stones. This magical stone, as we know, is the dolmen of the Carnutes, the ‘Guardians of the Stone’, but here, we are told for the first time that it was Gargantua himself who placed the megalithic dolmen on the land where the glorious cathedral now stands guard over it. We learn something else in these stories about this gargantuan “mover of giant stones” which is not quite so charming, and that is, that he is a clearer of forests. And like everything else Gargantua does, he does this in a big way. As Charpentier guardedly states, “if we may believe Rabelais, it was he who cleared La Beauce; he or at any rate his horse that by swishing its tail razed the oak forests that covered it.” (162) Let us be clear. These are the very same sacred forests of the Druids whose leafy branches extended themselves over the whole length and breadth of Beauce, those famed oak woods which constituted the spiritual center of Gaul, which this mare Beliard, in a furious fit of rage over the flying things that plague horses, has demolished in its entirety, right down to the last tree. You see, the destruction of a sacred grove is no small thing. It is a reprehensible act of sacrilege of such unimaginable magnitude that it is a commonplace occurrence in many places for people to go to great lengths to avoid such willful harm – even to a single tree. A fine instance of this is preserved by Robert Graves who quotes a direct descend-ent of one of the greatest of the high kings of Ireland, one St. Columba (521-597 C.E.). The scathing Druidic humor of this scene is part of the charm of the fith-fath spell, but what a sad, sad commentary it is on the demise of the great Gargantua. Are we to interpret this mythic remnant as some sort of Revenge of the Druids for the destruc-tion of their sacred forest of oaks, where for centuries they had celebrated their rites and passed judgement on all manner of things of great consequence, and upon which, after other churches before it, the magnificent Cathedral of Our Lady of Chartres was lifted up with its raftered roof timbers to resemble la forêt – a forest of trees? Clearly, these stories represent a time of catastrophic and traumatic change, possibly sometime in the mid-fourth century when the first Bishop of Chartres arrived, (174) long after all the Druids had been thrown out of Gaul or forcibly converted to Christianity. But there is also something else that we are being told that is concealed within that seemingly mindless, flatly delivered exclamation of Gargantua’s upon seeing the effects of the clearing of the forest: “Je trouve beau ce” (‘I find this beautiful’). For those who do not understand French and have thus missed the puerile humor of the pun being made on the place-name Beauce, the whole region which is named for Gargantua’s mother, Bélisama, we note that in the French language, the word bel is substituted for the word beau “before nouns singular beginning with a vowel or h mute.” (175) Beau and bel, therefore, have exactly the same meaning and one or the other is used inter-changeably as ruled by the vagaries of these specific circumstances. Underlying his seemingly inane pronouncement, is our knowledge that Gargantua is the son of sun gods, and not only that, but that he is the child of a mother who represents the very brightest point of the summer: the Solstice. These are words spoken by one who “occupied himself . . . much with the fertility of the earth,” with the clearing of forests, and with attending to all of the other petty details of housekeeping that make a landscape habitable in all seasons. (176) One would have to be blind to not see how truly pleased Gargantua would be to witness this vast clearing of the immense canopied forest and to exult in the sight of the resulting landscape of flattened fields as far as the eye could see, infinite and brilliantly illuminated by his mother’s light. Of course he found this beautiful! Although that was long, long ago, and everyone has forgotten about her through all these many centuries, this goddess of the high summer is quietly present on her day of the Summer Solstice in the majestic cathedral that rose on this beautifully illuminated landscape. On that longest day of the year at about the cardinal hour of noon, or so, when you see her light shinning on a tiny little nail in the floor of the immense cathe-dral, you will know that it is her day. And as you face the altar, not only will you be oriented to the direction of her ‘Mid-summer’ sunrise, but you will be facing into the full force of the telluric emanations. (177) And if you open yourself to the joy of it, allowing your whole being to “bathe in the terrestrial current,” (178) you will feel its waves of energy washing over you. You will be amazed by the intensity of the light. And if you listen carefully, perhaps you will even hear the “unheard music” (179) of the cathedral. 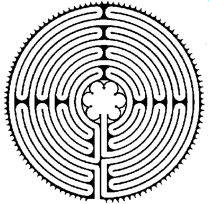 FRONTISPIECE ILLUSTRATION: The Labyrinth of Chartres Cathedral, ca. 1215-1221. This dating has been suggested by Craig Wright based on the verified dating of the construction of the nave. See: Jeff Saward at <http://www.labyrinthos.net/chartresfaq.html>. 1. Louis Charpentier, The Mysteries of Chartres Cathedral. English translation by Sir Ronald Fraser in collaboration with Janette Jackson. (London: Research Into Lost Knowledge Organisation, 1972-75; Originally published and translated into English by Robert Laffont (Paris: 6 place Saint-Sulpice, 1966. ), p. 181. 2. T. S. Eliot, Four Quartets, “Burnt Norton” I. 27. 3. Malcolm Miller, Chartres Cathedral. Sonia Halliday and Laura Lushington, Photography. Second Edition. (New York: Riverside Book Company, Inc., 1996), p. 9. 4. Ian Robertson, Blue Guide: Paris and Versailles. 8th Edition. (London: A&C Black, 1992), “St.- Sulpice”, p. 95. 5. Michelin Paris Atlas No. 11 Tourist Guide. 1st Edition. (Middlesex: Michelin Tyre Public Limited Company, n.d.) “Church of St-Sulpice”, p.193. 6. Ibid., “The Observatory”, p.198. The longitude is listed elsewhere as 2 degrees 20’ 14.025” East. See, for example: http://en.wikipedia.org/wiki/Prime_meridian. 9. Dan Brown, The Da Vinci Code. Special Illustrated Edition. (New York: Doubleday, 2004), Chapter 22, p. 110. This appears on p. 105 of the regular edition © 2003. 11. Ibid. Special Illustrated Edition, p. 113; p. 106 of the regular edition. Italics mine. 13. Ibid. Special Illustrated Edition, unpaginated p. 1; unpaginated p. 1 of the regular edition. 14. Ibid. Special Illustrated Edition, p. 110; p. 105 of the regular edition. 15. Titus Burckhardt, Chartres and the Birth of the Cathedral. William Stoddart, Trans. Keith Critchlow, Forward. (Ipswich: Golgonooza Press, 1995), p. 114. 16. J. L. Heilbron, The Sun in the Church: Cathedrals as Solar Observatories. (Cambridge, Mass. : Harvard University Press, 1999), pp. 219-226. 20. Louis Charpentier, The Mysteries of Chartres Cathedral, op. cit., pp. 9-10. 22. The Atlas of Mysterious Places: The World’s Unexplained Sacred Sites, Symbolic Landscapes, Ancient Cities and Lost Lands. Jennifer Westwood, Editor. (New York: Weidenfeld & Nicholson, 1987), p. 22 inset. A rare and beautiful photograph of the flagstone and tenon appears on p. 23. 23. Jean Markale, Cathedral of the Black Madonna: The Druids and the Mysteries of Chartres. Trans., Jon Graham. (Rochester, VT.: Inner Traditions, 2004), p. 226. Italics mine. 27. Many of the labyrinths originally installed in cathedrals in France were later destroyed by the Church itself, however, they existed “in great profusion [in] the Cathedrals of Northern France.” (<http://www.halexandria.org/dward021.htm>) A partial list compiled by Dan Sewell Ward includes the following: Chartres Cathedral of Notre Dame (Labyrinth still exists); Reims Cathedral of Notre Dame (Labyrinth destroyed in 1778); Bayeux Cathedral of Notre Dame; Amiens Cathedral of Notre Dame (Labyrinth destroyed in 1825, rebuilt in 1895); Saint Quentin Collegiate Church of Saint Quentin (Begun in 1195, completed in 1495, still exists); Sens Cathedral of Saint Etienne (30 ft. diameter labyrinth destroyed 1768, similar in design to Auxerre’s labyrinth demolished in 1690); Saint Omer Collegiate Church of Notre Dame at Abbey of St. Bertin (Labyrinth destroyed 1778, the same year as labyrinth of Reims); Poitiers Church of Notre Dame de la Grande. Dan Sewell Ward at <http://www.halexandria.org/dward758.htm> We highly recommend this extremely well researched site. Plan to spend a lot of time there. Definitely worth the voyage. 29. Bonnie Blackburn & Leofranc Holford-Strevens, The Oxford Companion to the Year: An Exploration of Calendar Customs and Time-reckoning. (Oxford: Oxford University Press, 1999), “24 June”, p. 263. 32. Umberto Eco, Foucault’s Pendulum. Translated from the Italian by William Weaver. (San Diego: A Helen and Kurt Wolff Book/ Harcourt Brace Jovanovich, Publishers, 1989), p. 401. 33. See descriptions of the St. John’s Day celebrations in: Bonnie Blackburn & Leofranc Holford-Strevens, The Oxford Companion to the Year: An Exploration of Calendar Customs and Time-reckoning, op. cit., p. 264; See also: John Matthews, The Summer Solstice: Celebrating the Journey of the Sun from May Day to Harvest (Wheaton, Ill.: Quest Books, 2002), pp. 85-99; See also: Tracy Boyd, “Titania, The Queen of Faerie, and The Druid Tom Thumbe” under the heading: “The Thumb in the Pudding” at <www.sacredthreads.net>. 34. E. K. Chambers, The Mediaeval Stage. (Mineola: Dover Publications, 1966. Two Volumes as One unabridged republication of the 1903 edition), Vol. I, p. 241. 35. Ibid., Vol. 1, p. 241, Note 1. 37. See: Tracy Boyd, “The Keepers of the Flame: Vesta and Her Brides” at <www.sacredthreads.net>. 38. For a fascinating astronomical article on the Winter Solstice, see: <http://en.wikipedia.org/wiki/Winter_Solstice>. 39. E. K. Chambers, The Mediaeval Stage, op. cit., Vol. I, p. 241, Note 1. 41. Shakespeare, Twelfth-Night; or, What You Will, III. iv. 54. 42. For a thorough discussion of this phenomena, see Tracy Boyd, “Titania, The Queen of Faerie, and The Druid Tom Thumbe”, under the heading: “The Thumb in the Pudding” at <www.sacredthreads.net>. 43. John Matthews, The Summer Solstice: Celebrating the Journey of the Sun from May Day to Harvest. (Wheaton, IL: Quest Books Theosophical Publishing House, 2002), p 86. 48. W. B. Yeats, editor, Fairy and Folktales of the Irish Peasantry, reprinted in A Treasury of Irish Myth, Legend, and Folklore. (NY: Crown Publishers, Inc., Gramercy Books, an imprint of Random House, Inc., 1986), p. 2. 49. Louis Charpentier, The Mysteries of Chartres Cathedral, op. cit., p. 9. Italics mine. 50. Ibid., p. 10. Italics mine. 51. Ibid., p. 111. Italics mine. 53. Colin Wilson, The Atlas of Holy Places & Sacred Sites: An Illustrated Guide to the Location, History and Significance of the World’s Most Revered Holy Sites. (New York: DK Publishing, Inc., First American Edition, 1996), “Aachen”, p. 61. The Palatine Chapel was later expanded to become Aachen Cathedral, known in French as Aix-la-Chapelle. See Ibid. 54. The Atlas of Mysterious Places: The World’s Unexplained Sacred Sites, Symbolic Landscapes, Ancient Cities and Lost Lands, op. cit., p. 22. 55. Umberto Eco, Foucault’s Pendulum. op. cit., p. 6. 59. T. S. Eliot, Four Quartets, “Burnt Norton” II. 62. 60. See: Tracy Boyd, “Wind Over Water: The Breath of Creation” at <www.sacredthreads.net>. 61. Umberto Eco, Foucault’s Pendulum, op. cit., p. 5. 62. The Way of Life According to Laotzu, An American Version by Witter Bynner (New York: The John Day Company, 1944), #14, p. 32. 63. Louis Charpentier, The Mysteries of Chartres Cathedral, op. cit., p. 11. 64. The Atlas of Mysterious Places: The World’s Unexplained Sacred Sites, Symbolic Landscapes, Ancient Cities and Lost Lands, op. cit., p. 22. 67. Alwyn Rees and Brinley Rees, Celtic Heritage: Ancient Tradition in Ireland and Wales. (London: Thames and Hudson 1961), p. 346. 68. For a description of this nowhere state, see: Ibid., p 345. 69. For an in-depth discussion on the benefits of threading the maze, see: Tracy Boyd, “The Daunce of Nine-Men’s-Morris and the Boundaries Between Worlds”, under the headings: “Down To Earth” and “The Realm of Faerie” at <www.sacredthreads.net>. 70. T. S. Eliot, Four Quartets, "Burnt Norton" II, 63-64. 71. The Atlas of Mysterious Places: The World’s Unexplained Sacred Sites, Symbolic Landscapes, Ancient Cities and Lost Lands, op. cit., p. 22. 72. Louis Charpentier, The Mysteries of Chartres Cathedral, op. cit., p. 172. 76. See: Tracy Boyd, “The Tarot Fool’s Hand” under the heading: “The Fool’s Dance” at www.sacredthreads.net. 77. Maria-Gabriele Wosien, Sacred Dance: Encounter with the Gods. (New York: Thames and Hudson, 1974), p. 27. 79. Lillian B. Lawler, The Dance in Ancient Greece. (Middletown, CT: Wesleyan University Press, 1965), pp. 47-48, and pp. 44-48 passim. 80. <http://www.labyrinthos.net/chartresfaq.html> For a fascinating journey through a multitude of labyrinths, see: Jeff Saward, Labyrinths & Mazes: A Complete Guide to Magical Paths of the World. (New York: Lark Books, a Division of Sterling Publishing Co., Inc., 2003. 81. Maria-Gabriele Wosien, Sacred Dance: Encounter with the Gods, op. cit., p. 27. 83. Ibid. Another very thorough examination of the cathedral dances is to be found in E. Louis Backman, Religious Dances: in the Christian Church and in Popular Medicine. E. Classen, Trans. (London: George Allen & Unwin Ltd., 1952), pp. 66-73. 84. E. K. Chambers, The Mediaeval Stage, op. cit., Vol. I, p. 129. 85. Paul Devereux, Secrets of Ancient and Sacred Places: The World’s Mysterious Heritage. (London: Brockhampton Press, 1998), p. 140. 86. Louis Charpentier, The Mysteries of Chartres Cathedral, op. cit., p. 180. 87. This is especially true in his Cathedral of the Black Madonna: The Druids and the Mysteries of Chartres, op. cit., which is filled with inaccuracies, absurd conjecture, very far-fetched conclusions with no apparent trace of logic, and bristling hostility towards neo-Pagan practice. 88. Prudence Jones and Nigel Pennick, A History of Pagan Europe. (New York: Barnes & Noble Books, 1999), p. 85. 89. See: Gaius Julius Caesar, De Bello Gallico. Available in English in Caesar, The Conquest of Gaul. S. A. Handford, Trans., 1951, Jane F. Gardner, Revision, 1982 (New York: Penguin Books USA Inc., 1982). His commentaries concerning the Druids are to be found in Book VI.13-20, pp. 139-143. 90. An 1866 edition of this published by the Société archéologique d'Eure-et-Loir, Chartres is available on Google Books at <http://books.google.com/books?id=VMQnAAAAYAAJ&dq=Jean-Baptiste+Souchet,+Chartres&printsec=frontcover&source=bl&ots=hZm0U61cyF&sig=tawY03nFkhLEDDLZOApoBkoLpYc&hl=en&ei=I2IsSpOaB4-MNYTS8NMJ&sa=X&oi=book_result&ct=result&resnum=5#> Of course, it is in French. 91. L’abbé Marcel Joseph Bulteau, Monographie de la Cathédrale de Chartre, 3 Vols. 1887-1892. The abbot was not only a priest, but a membre de la Société archéologique d'Eure-et-Loir. 92. Gaius Julius Caesar, De Bello Gallico. Available in English in Caesar, The Conquest of Gaul, op. cit., Book VI.13., p. 140. 93. Colin Wilson, The Atlas of Holy Places & Sacred Sites: An Illustrated Guide to the Location, History and Significance of the World’s Most Revered Holy Sites, op. cit., “Chartres”, p. 60. 94. John Michell, The New View Over Atlantis. (London: Thames and Hudson, 1995 Reprint of The View Over Atlantis © 1969, 1972, 1983), p. 197. 96. Ibid., quot. W. Y. Evans Wentz, The Fairy Faith in Celtic Countries. (London: Henry Frowde, 1911. We have spoken at length about Evans Wentz and this exceptionally wise book with reference to Newgrange in “Tracy Boyd, “The Mythic Ground of the Longing for Wisdom and Love in William Butler Yeats’s The Song of Wandering Aengus” under the heading: “The Gardens of the Sun” at <www.sacredthreads.net)>. 97. John Michell, The New View Over Atlantis, op. cit., p. 198. 98. Louis Charpentier, The Mysteries of Chartres Cathedral, op. cit., p. 13. 100. This being the commonly used name of the cave that contained the ancient sacred well and a Druidic statue of a virgin. 101. Only because the ground is so sacred that none has dared disturb it with excavations. 102. Gordon Strachan, Chartres: Sacred Geometry, Sacred Space. With architectural drawings by Oliver Perceval. (Edinburgh: Floris Books, 2003), pp. 10-12, with illustration of the axes and quoted caption, on. p. 11. Sad to say, we will be hearing no more from this exceptional man who died in July of 2010. For a brilliant discussion of the proportional relationships of Stonehenge’s stone alignments, see: Gyorgy Doczi, The Power of Limits: Proportional Harmonies in Nature, Art & Architecture. (Boston: Shambhala, 1985, pp. 38-40. Just read the whole book! 104. See: Ernest G. McClain, The Myth of Invariance: The Origin of the Gods, Mathematics and Music From the Rg Veda to Plato. Patrick A. Heelan, Editor. (York Beach, ME: Nicolas Hays, Inc., 1984, p. 103; and regarding the “tuning” of the Sun and Moon in the Rg Veda, see Chapter 8, “Music and the Calendar, pp. 95-106. 105. Gordon Strachan, Chartres: Sacred Geometry, Sacred Space. With architectural drawings by Oliver Perceval, op. cit., Endnote 7, p. 103. 106. See: Louis Charpentier, The Mysteries of Chartres Cathedral, op. cit., Chapter 16, “The Musical Mystery”, pp. 128-136 passim. 110. Ibid., Chart on p. 130. 112. Gyorgy Doczi, The Power of Limits: Proportional Harmonies in Nature, Art & Architecture, op. cit., p. 115. 113. Ibid., p. 116. Doczi provides numerous illustrated examples throughout the book. 114. Louis Charpentier, The Mysteries of Chartres Cathedral, op. cit., p. 135, quot. Father Bescond of Saint-Wandrille, who informed Charpentier that he had “found the answer to the harmonic problem,” thus solving the formula for the “musical development of the elevation,” which is given on Ibid., pp. 135-36. It is unclear to this non-musician which of the eight Gregorian modes he refers to – if any. We are certain, however, that Father Bescond’s reference to the “earlier” mode which began on the note RE (D), refers to a scale that was in use prior to the introduction of DO (C). (See: <http://www.rosarychurch.net/answers/qa012006.html> under the heading “Notation”.) Fr. Bescond adds that “The ‘good notes’ of this mode are RE-FA-LA,” (Louis Charpentier, The Mysteries of Chartres Cathedral, op. cit., p. 135.) which would be the notes D-F-A. 115. Titus Burckhardt, Chartres and the Birth of the Cathedral, op. cit., p. 94. 117. A phrase that begins and ends the description of land on Property Deeds. 119. Gordon Strachan, Chartres: Sacred Geometry, Sacred Space. With architectural drawings by Oliver Perceval, op. cit., p. 11. 121. John Michell, The New View Over Atlantis, op. cit., p. 200, and pp. 127-136 passim. Louis Charpentier offers many additionally plausible theories throughout his The Mysteries of Chartres Cathedral, none of these theories being mutually exclusive of one another. 122. John Michell, The New View Over Atlantis, op. cit, p. 198. 123. Louis Charpentier, The Mysteries of Chartres Cathedral, op. cit., pp. 37-38. 128. Ibid., p. pp. 21-22 and pp. 22-30 passim. 130. John Michell, The New View Over Atlantis, op. cit., p. 200, and pp. 198-200 passim. 132. Gertrude Jobes, Dictionary of Mythology Folklore and Symbols. (New York: The Scarecrow Press, Inc., 1962), “Druid altar”, Part 1, p. 472. 133. <http://www.new-age.co.uk/stonehenge-standing-stones.htm>. This New Age website has a splendid collection of remarkable photographs of contemporary Druid Solstice rites at Stonehenge. 134. The English title given here is just a translation. Sadly, it is not available in English. 135. Louis Charpentier, The Mysteries of Chartres Cathedral, op. cit., p. 23. 136. See: Miranda J. Green, Dictionary of Celtic Myth and Legend. (London: Thames and Hudson Ltd., 1992), “Apollo Belenus”, pp. 30-31. 137. James MacKillop, Dictionary of Celtic Mythology. (Oxford: Oxford University Press, 1998), “Belenus, . . .”, p. 34. 139. Robert Graves, The White Goddess: A Historical Grammar of Poetic Myth. (New York: Farrar, Straus and Giroux, 1974; 7th Printing of Amended and Enlarged Edition of 1966), p. 56. 141. See: Ibid., Chapter Two, “The Battle of the Trees”, pp. 27-48. 142. Ibid., Robert Graves, The White Goddess: A Historical Grammar of Poetic Myth, op. cit., p. 58. 144. Ibid., p. 201. Perhaps Edward Davies, the widely admired Welsh scholar of Celtic languages and mythologies whose idea this was, (Ibid. ; See also: <http://en.wikipedia.org/wiki/Edward_Davies_(Celtic)>) saw the connection between the alphabet and the seasons of the year, a living calendar whose intricacies the poet Robert Graves devoted an entire book to deciphering a century later. The title was, of course, his famous The White Goddess: A Historical Grammar of Poetic Myth. 145. Robert Graves, The White Goddess: A Historical Grammar of Poetic Myth, op. cit., p. 200. 146. R. A. S. Macalister, The Archaeology of Ireland. (New York: Arno Press: A New York Times Company, Reprint Edition, 1977. First published London, 1928; Second edition, revised and rewritten, 1949; Reissued 1972 by Benjamin Blom, Inc.), p. 333. 147. For a discussion of the etymology of Druid, see: Tracy Boyd, “Titania, The Queen of Faerie, and the Druid Tom Thumbe” under the heading: “Tom Thumbe’s Irish Beginnings” at <www.sacredthreads.net>. 148. R. A. S. Macalister, The Archaeology of Ireland, op. cit., p. 337. 149. See: Nigel Pennick, Magical Alphabets. (York Beach, ME: Samuel Weiser, Inc., 1993), passim. 150. The Ogham alphabet is considered in great detail in: Tracy Boyd, “The Tarot Fool’s Hand” under the heading: “The Fool’s Alphabet: A Secret Language of Trees” and elsewhere throughout the article at <www.sacredthreads.net>. For a very informative discussion of the sounds of the planets’ orbits, see: Hans Cousto, The Cosmic Octave: Origin of Harmony. Christopher Baker and Judith Harrison, Translators. (Mendocino, CA. : LifeRhythm, 1988. 151. Louis Charpentier, The Mysteries of Chartres Cathedral, op. cit., p. 25, presumably quoting Volume I of Abbé Marcel Joseph Bulteau’s Monographie de la Cathédrale de Chartre, 3 Vols. 1887-1892. 152. Anne Ross, The Pagan Celts. (Ruthin, North Wales: John Jones Publishing Ltd., 1998), p. 140. 153. Louis Charpentier, The Mysteries of Chartres Cathedral, op. cit., p. 178. 156. Ibid. ; See also <http://en.wikipedia.org/wiki/Proto-Celtic_language> under the heading “Dating” regarding the reconstruction of the Proto-Celtic language which may date as far back as 6100 B.C.E. 157. See: Louis Charpentier, The Mysteries of Chartres Cathedral, op. cit., pp. 181-82 regarding the curative powers of this well. 159. Louis Charpentier, The Mysteries of Chartres Cathedral, op. cit., p. 23. 160. Rabelais is said to have been inspired to “provide a sequel” to the fabulously popular chapbook of which he said, “sold more copies in two months ‘than there will be Bibles in nine years’.” Sterling Allen Brown, The Reader’s Companion to World Literature: A Guide to the Immortal Masterpieces of Writing from the Dawn of Civilization to the Present. Second Edition. Hornstein, Percy, Brown, Eds. (New York: Signet Classic/New American Library/Penquin Putnam, Inc., 2002), p. 285. 161. Louis Charpentier, The Mysteries of Chartres Cathedral, op. cit., p. 23. 163. François Rabelais, Gargantua and Pantagruel, Sir Thomas Urquhart and Peter Antony Motteux, Trans. Book 1, Chapter 1.XVI.—”How Gargantua was sent to Paris, and of the huge great mare that he rode on; how she destroyed the oxflies of the Beauce.” pp. 96-97, is a Public Domain publication of the Pennsylvania State University furnished free and without any charge of any kind. 164. In an Appendix following the Notes for Tracy Boyd, “I Am Baubo, the Acorn Fool” at <www.sacredthreads.net.> is the story of “The Sacrilege of Erysichthon” as told by Ovid in the Metamorphoses, which tells of the senseless mutilation and killing of the most sacred oak in Ceres’s ancient oak grove; a chilling and very graphic account of what can happen to the perpetrators of such violence against sacred trees. 165. Robert Graves, The White Goddess: A Historical Grammar of Poetic Myth, op. cit., p. 143. 167. Walter Yeeling Evans-Wentz, The Fairy-Faith in Celtic Countries. (New Hyde Park, NY: University Books, Inc., First Printing, June 1966, First published in this form by Oxford University, 1911), p. 38. 170. Richard Johnson, “The History of Tom Thumb” in Iona and Peter Opie, The Classic Fairy Tales. (Oxford: Oxford University Press, 1974, Reissued 1992), p. 44. The entire tale published by Richard Johnson as The History of Tom Thumbe, the Little, for his small stature surnamed, King Arthur’s Dwarfe: Whose Life and aduentures containe many strange and wonderfull accidents, published for the delight of merry Time-spenders, of which only one copy has survived, is here reproduced on pp. 33-46. 173. Ibid. The whole story of Tom Thumbe is explored in: Tracy Boyd, Titania, the Queen of Faerie, and the Druid Tom Thumbe at <www.sacredthreads.net>. 174. Malcolm Miller, Chartres Cathedral, op. cit., p. 8. 175. The New Cassell’s French Dictionary. Revised by Denis Girard. (New York, Funk & Wagnalls, 1962-1971), “beau”, p. 84. 176. See: Louis Charpentier, The Mysteries of Chartres Cathedral, op. cit., p. 23. 177. See: Ibid., pp. 34-35. 179. T. S. Eliot, Four Quartets, “Burnt Norton” I. 27.